Places to eat at Disneyland include Mexican, Italian, and good ol' American foods. The kind of places range from walk-up stands to full-service, sit-down restaurants. No matter where you decide to eat, avoid standing in line by eating at mid-morning or mid-afternoon. As a bonus, you'll also find shorter lines at the rides during traditional meal times, especially mid-day. If you look around, you can find places at Disneyland to eat for less. Prices and offerings change so often that giving you a list would likely frustrate you more than no list at all, but these tips will help you find something within your budget. Walk-up, counter-service spots have the lowest prices. And the fewest frills. Try Bengal Barbecue (across from the Indiana Jones ride), Royal Street Veranda (New Orleans Square), Stage Door Cafe (near the riverboat boarding area) or Tomorrowland Terrace. The corn dog cart on Main Street USA next to the Plaza Inn is a good place to get something quick and tasty, but only for meat eaters. Use the Disneyland map you got at the entrance to find dining options in each park area. It can help you find something nearby when you need it - and it also gives a rough idea of what items each place serves. Smoked turkey legs are not only tasty, but there's also something fun about gnawing on a big chunk of meat. We found them at a sidewalk cart near the Walt and Mickey statue on Main Street USA. According to some sources, one leg can have more than 1,000 calories. If you split it with someone, it brings the cost (and calorie consumption) down. A common money-saving tip is to bring your own water bottles and fill them at the nearest water fountain. It saves on meal costs because you won't have to buy drinks. If you're like me, public water fountains look like a swimming cesspool of everyone else's bacteria and that tip falls on deaf ears. Don't give up on the idea -- instead, fill your water bottle inside any self-service restaurant. The cheapest option of all is to bring your own food. You can take small snack items inside with you, but if you take a bigger meal, you'll have to consume it at the picnic area outside the gate. And store it somewhere until you need it, which means using the lockers or making a trip back to your hotel or car. Full-service restaurants where you can sit down, relax and get a break include The Blue Bayou, Cafe Orleans, Big Thunder Ranch Barbecue, and Carnation Cafe are. You can make reservations for some of those restaurants - Disney calls it "priority seating" - you'll need them to avoid disappointment during busy times (or for Blue Bayou any time). Call at least a couple of weeks in advance or reserve online. The Blue Bayou (the restaurant you see as you board the Pirates of the Caribbean ride) is the "fine dining" spot according to Disneyland, but many reviewers disagree and so do we. Many who like it say it's because of the atmosphere and location, but if you're a foodie, it's not for you. Keep reading to find out where the real fine dining is at the Disneyland Resort. If you have a Park Hopper Pass, consider a meal at the Wine Country Trattoria in California Adventure, which has some of the best food in the parks. Get their World of Color dining package and you'll not only get an entrance pass to the best viewing location, but you won't have to stand in line to pick it up. You can't buy alcoholic beverages at Disneyland, but they're available at several locations in California Adventure, including the Carthay Circle bar, Cove Bar near Ariel's Grotto and a wine bar next to the Wine Country Trattoria. There's a limit of 2 drinks per adult more than age 21 (with ID). Self-service dining where you walk up to order but sit at a table to eat, includes the Plaza Inn, French Market, and Redd Rocket's Pizza Port. The Jolly Holiday Bakery on Main Street USA, just across from the Plaza Inn has great grilled cheese sandwiches with tomato soup. Try their Matterhorn macaroons for dessert. All three hotels and Disneyland's Plaza Inn offer breakfast buffets with a side helping (or possibly the main course) of Disney characters. Meet the characters even when you aren't eating. Outside the park, you'll find several places to eat in Downtown Disney and a short walk away at Anaheim Garden Walk. Denny's and other low-cost places to eat line the street just outside the entrance. All of them will be packed to over-capacity at meal time. All of the Disney hotels offer dining options, but the Napa Rose at the Grand Californian Hotel is the true fine dining venue at Disneyland Resort, gathering great ratings from almost everyone who tries it. Dress code is ultra-casual and the servers go beyond the level of service we've all learned to expect from Disney: all of them are first-level sommeliers or on their way to becoming one. If you haven't guessed, it's also expensive, but most people think it's worth it. Steakhouse 55 at the Disneyland Hotel also offers a fine dining experience. And they serve the best afternoon tea west of London. You'll find plenty of places to get ice cream bars, popcorn, sodas, and the standard snacks at Disneyland, but in my opinion, the one treat worth waiting for is just inside the Adventureland entrance. The Tiki Juice Bar outside the Tiki Room serves the Dole Whip, a frozen pineapple concoction that you can eat with a spoon or sip as a float served with pineapple juice. And if you love Dole Whip but hate to wait, you can also get it at the coffee shop next to Goofy's Kitchen at the Disneyland Hotel. Disneyland churros are so popular that the deep-fried, sugar-and-cinnamon coated snacks have their own Facebook page. Last but not least, there's food that looks like "the mouse." 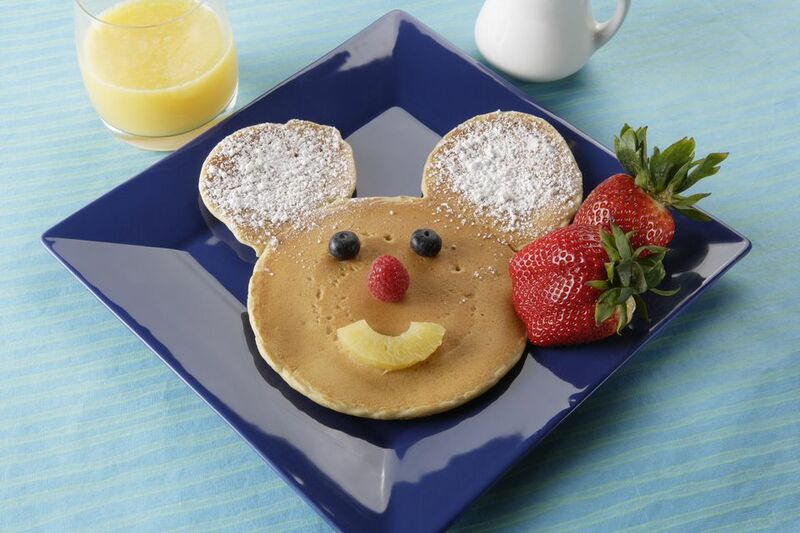 On a recent visit, we found and photographed 20 different food items, all shaped like Mickey Mouse. Take a look. A few healthier options at Disneyland include grilled skewers at Bengal Barbecue (they have one that's all vegetables) and grilled chicken Caesar salad at Hungry Bear in Critter Country. For healthy snacks, you'll find fresh fruit at carts on Main Street USA, in Adventureland and New Orleans Square.